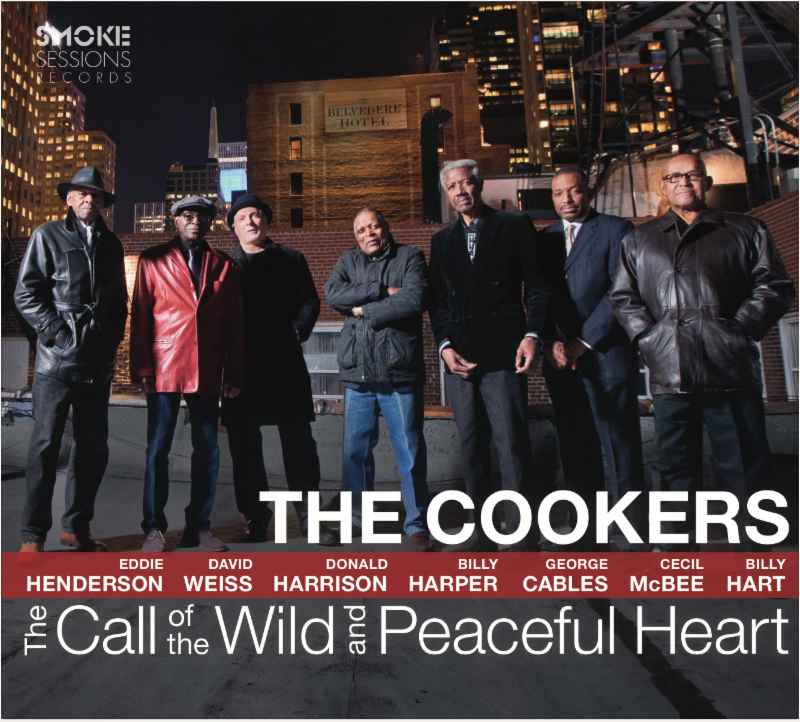 The Cookers, the veteran jazz supergroup that The New York Times calls "a dream team of forward-leaning hard-bop," returns with its fifth and most exhilarating album to date, The Call of the Wild and Peaceful Heart. After nine years together, The Cookers have evolved from a summit of swinging road warriors to become simply one of the most burning and hardest-hitting bands on the scene. "At this point, we've gelled as a band with an original voice, so the goal is just to be that much stronger each time out," says David Weiss, the next-generation trumpeter that assembled this gathering of elders. "The band itself should be the story at this point, I hope, but I think this album shows off a much stronger spiritual side of the group then previous efforts. I don't know if that's what happens when such great musicians who share this common bond spend so much time together, or maybe it's just that some of the material we chose for this album conveys this spirit so well, but it's certainly there and is quite powerful." 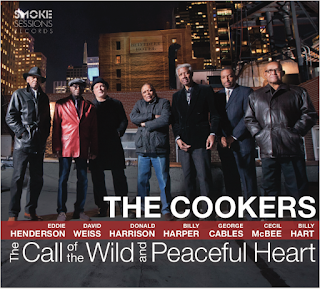 The Call of the Wild and Peaceful Heart, due out September 9, marks The Cookers' debut on Smoke Sessions Records and is the follow up to their critically acclaimed release Time and Time Again which was the iTunes' Jazz Album of the Year in 2014. Once again, the core of the band consists of five legendary, long-undersung musicians whose credentials read like a who's-who of classic-era jazz: tenor saxophonist Billy Harper was a member of groups led by Lee Morgan and Max Roach and served a two-year stint with Art Blakey's Jazz Messengers; trumpeter Eddie Henderson and drummer Billy Hart were both part of Herbie Hancock's electrifying Mwandishi ensemble; pianist George Cables played alongside Dexter Gordon and Art Pepper; and bassist Cecil McBee anchored Charles Lloyd's famed 1960s quartet with Keith Jarrett and Jack DeJohnette. They're joined by torchbearers Weiss and, in his second outing with the band, alto saxophonist Donald Harrison. The new album's title comes from Harper's opening track, originally recorded for the saxophonist's 1975 album Black Saint. The "wild and peaceful heart" was meant to refer to the dueling passions to be found in the soul of the composer himself, but applies equally well to this ensemble, whose repertoire can range from the tempestuous force of Hart's "Oceans of Time" to the wistful soul of McBee's "Third Phase." As Harper puts it, "The group is set up in such a way that there's a balance of hard drive and cool expressions." That balance can be nimbly struck in the space of a single composition, as on Harper's album-closing "Thy Will Be Done." The piece begins in the mood of latter-day Coltrane's spiritually seeking excursions, eventually settling into a becalmed but vigorous groove that Harper refers to as "a swinging prayer." Like all three of Harper's contributions to the album, the song features a new arrangement by the composer. The unique septet, Harper says, "lends itself to a wider range of colors. It's like having the palette of a big band that drives and cooks like a small group." As always, the album's repertoire is plumbed from the members' vast discographies, a bevy of riches that Weiss says continues to yield surprises. After exhausting what he calls "David's fantasy list" of the group's compositions on The Cookers' first two albums, he's consistently discovered new favorites, embellished by the band's growing camaraderie. "I always think, 'How did I miss this last time?' But as the band grows and I realize more and more what they're capable of, certain tunes speak to me differently the next time through. I think this is our strongest record and top to bottom the strongest collection of tunes that we've done." Following the urgent momentum of Harper's title tune comes the sharp, soulful swagger of Cables' "Beyond Forever" from his 1994 date of the same name, which first appeared on Eddie Henderson's 1977 release Comin' Through. The album's sole debut recording is McBee's "Third Phase," which begins with the pianist in a contemplative mood before the horns enter to sing the memorable melody. Hart previously recorded the abstract, dark-hued "Teule's Redemption" with his own quartet on his 2014 ECM release One Is the Other, and the song's Ornette-inspired jaggedness is only bolstered by The Cookers' four-horn frontline. Though he's known for his hard-driving approach, Harper contributes the album's most tender moment with his ballad "If One Could Only See," inspired by a dream in which a hand reached down from heaven and handed him a cassette tape containing the song's wounded but steely melody. Native American influences are obvious in Cables' "Blackfoot," culled from his 1993 SteepleChase debut I Mean You, while Hart's "Oceans of Time" was the title track of his 1997 release. "These guys should all be considered giants on their own," Weiss insists. "The idea of The Cookers is to bring them to greater prominence, and a big part of that is this incredible legacy of compositions." The Cookers is unique in the modern jazz landscape, a band that benefits from more than four decades of rapport and shared experiences, as well as first-hand knowledge of the seismic shifts in the music that younger musicians only know through records and stories. "They all come out of basically the same era," Weiss says. "They all saw the same things, they were all blown away by seeing John Coltrane in 1965 - they were all part of something bigger than us. They were right there when some groundbreaking stuff happened, and they still approach the music that way." "The Call of the Wild and Peaceful Heart" was recorded live in New York at Sear Sound's Studio C on a Sear-Avalon custom console at 96KHz/24bit and mixed to ½" analog tape using a Studer mastering deck. Available in audiophile HD format.